- Modified automatic installation pacakage. - Automatic Language Selection by OS. - Can be choose language by /KR and /EN option. - Fixed problem that progress bar seems something strange after drag and drop files and selected one file. - Stop encoding not response problem fixed. - Compatibles all 32bit Windows OS. - new version of bass.dll and Nero Encoders . 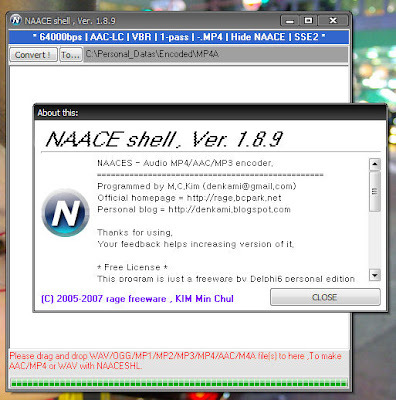 - RICHEDIT capacity error.This program is all free to use.Commercial using not allowed by Nero AAC encoder.